« *** WINNERS *** Janet, Delena, Wanda and Becky are Living the Life of Riley! CONGRATULATIONS! Riley loves both sets of her grandparents immensely and I know they definitely feel the same way about her. The grandparent/child relationship is such a special one that should be celebrated and cultivated. Many grandparents may need a few creative ideas though, on how to turn the time they spend with their grandchildren into a meaningful and memorable bonding time. Now, there's a company whose goal it is to forge new traditions and experiences between grandparents and grandchildren, called GrandCamp Adventures. I recently had the opportunity to review the "Here We Go!" storybook and music CD. Keep reading to learn more! 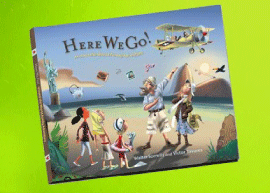 I reviewed the GrandCamp Adventures Fun Pack, which includes the "Here We Go!" 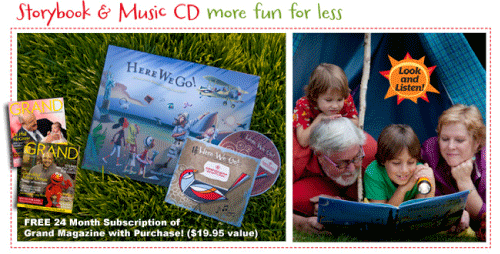 Storybook and Music CD and retails for $29.95. I was very excited to receive the "Here We Go" storybook and music CD, for I just knew that this would be a wonderful adventure that possibly my parents could embark on with Riley once she was a little older. I read the storybook first, and thought that it was very interesting. This book is filled with unique and strange characters from far away lands and the illustrations were wonderful. Unfortunately, I was having a tough time finding where the activities were for the grandparents to perform with their grandchildren. I decided to visit the music CD and listen to the ten different songs here. There was a great mix of genres, including jazz, bluegrass and reggae, which complimented the story really well and were easy to sing and dance to. I especially liked the "Love and Happiness for You" and "Nobody Loves Me Like My Grandma" songs, but I still wasn't finding the activities that would help forge new family traditions and bonding moments. So far, all I had was a very exciting and adventurous story and a toe-tapping CD with some wonderful grandparent themed songs. Finally, on the last page of the book was a page entitled, "You Become the Story...", which gave a one or two sentence description of the activities which were designed to correlate to the story. I guess I was still expecting something more, for there just weren't any details to the activities described here and it seemed that the authors were being purposefully vague. I decided to go to their website again to try and find the resources that were being referred to and after a little more searching, I checked their online store. That's where all of the activities and instructions were! GrandCamp Adventures sells the entire experience and unfortunately, it's fairly expensive. I have to admit that I was a little disappointed at how the storybook and the music CD, which cost $30, couldn't really lend themselves to creating these wonderful grandparent traditions without purchasing the other components from GrandCamp Adventures. It seems to me that there should at least be basic guidelines of how to do the activities associated with the "Here We Go!" storybook, because without these guidelines, the book is just a story and nothing more. To purchase the kits for the other four activities, costs an additional $136, which seems pretty steep to me. Personally, I think that GrandCamp Adventures would have done much better creating several different mini-adventures for grandparents and grandchildren which were all inclusive, instead of having one story with components that all depend on each other. Although the idea here is a great one, I'm afraid that I wouldn't recommend this storybook or CD unless you are ready to buy most all of the GrandCamp Adventures components. What kind of events or activities do you recommend for grandparent/child bonding? Disclosure: I received the GrandCamp Adventures "Here We Go!" Storybook and CD from GrandCamp Adventure Inc. in order to facilitate my review. No other compensation was received. This product review is based on my own personal experiences with this item and is completely honest and objective. That sounds really cool! I hadn’t heard of it. I found you on a Friday blog hop and thought I’d leave a comment saying I’m a new follower! Hi ! Visiting you from Mama to 4 Blessings bloghop – I am your newest follower. Glad I found you… feel free to visit my site and browse around, too. You are right – motherhood is a most amazing and excellent journey! 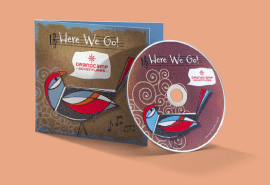 Melissa – thanks for your review of our new Storybook and CD. It was great to hear you call them “a very exciting and adventurous story and a toe tapping CD.” We also appreciate your constructive comments on bundling of activities with the book and our pricing. We actually started the product line with everything together as you’d suggested. However, after talking with friends, prospects and store owners, we deliberately unbundled the games & activities in order to give our customers maximum flexibility to spend the time and money that best fits their situation. Top talent and very high quality materials and techniques are used in the creation of our products and we recognize not everybody has the budget for every element of an adventure (storybook, games, activities, etc.). We therefore designed the storybook, CD and activities to either stand on their own or be enjoyed as a multi-faceted adventure. Again, flexibility being the goal. Hopefully, this brings a little perspective as to why the storybook was unbundled from the rest of the activities. The time you took to interact with and review our products is much appreciated. Every business is a work in progress and, as the first company focused on the Grandparent-Grandchild market, we’re a bit shy on precedents and know that it’s only through feedback like your blog post that we can continue to grow.